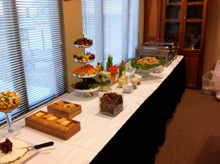 Have your next event at Eagles' Landing and discover the difference our experienced staff can make. 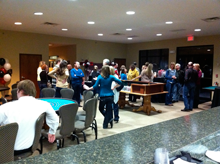 We offer shotgun or tee time tournaments and golf & poker combination events. 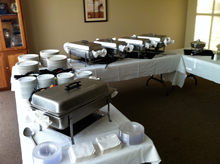 Our banquet facility can host business meetings and we can cater your birthday or special occasion party. Call us at (816) 318-0004 to get started. Under a shotgun tournament format, you will be reserving the entire golf course and will be required to have a minimum of 72 players on weekdays and 100 players on weekends. Please note: We will still offer shotgun tournaments with less than the minimum number of players, but the golf course reserves the right to fill the course with open play. We do not allow shotgun tournaments on holidays. Groups will be assigned a tee time off of the 1st or 10th tee.